In the wild, Phalaenopsis equestris, a magenta-colored moth orchid, boasts clusters of 10 to 15 flowers measuring 2.5 cm in diameter. Ten years ago, plant hunter Hung Hsin-chieh collected specimens on Jimagaod or Lesser Orchid Island off the southeastern coast of Taiwan. Since the orchid was rare in the wild, it sold at a high price, sparking commercial plant traders to recklessly pick the orchids for sale. As a result, these orchids have become extinct in the wild. Thanks to a documentary about Taiwan’s “plant hunters” that created a lot of internet buzz in early November last year, many people realized that Taiwan boasts the conservation center with the largest and most diverse collection of subtropical and tropical plants in the world. Conservative estimates expect one third of plants in tropical habitats around the globe to become extinct by the end of the 21st century due to excessive logging. 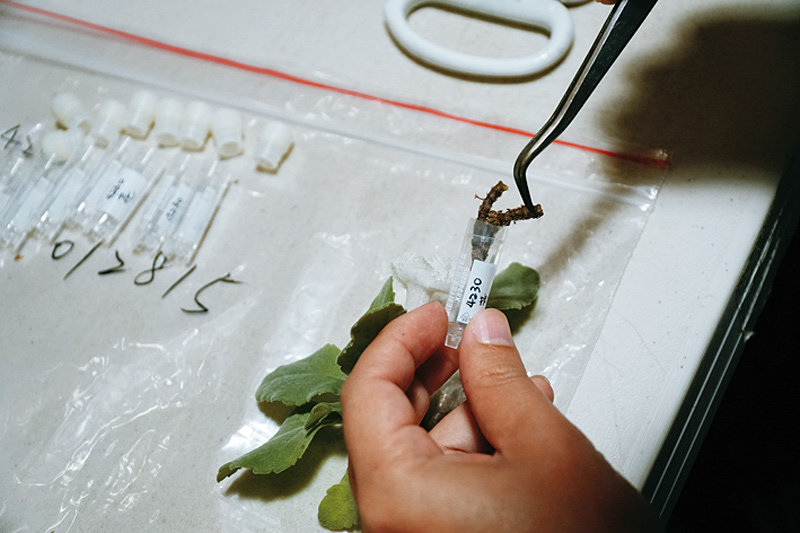 The mission of the Dr. Cecilia Koo Botanic Conservation Center (KBCC) in Gaoshu Township in Pingtung County is racing against time to collect as many live specimens before they become extinct in the wild, and to cultivate and propagate them in nurseries to conserve biodiversity. The center’s 32 employees are responsible for managing 17 greenhouses and two controlled-temperature houses that shelter a collection of plant species. 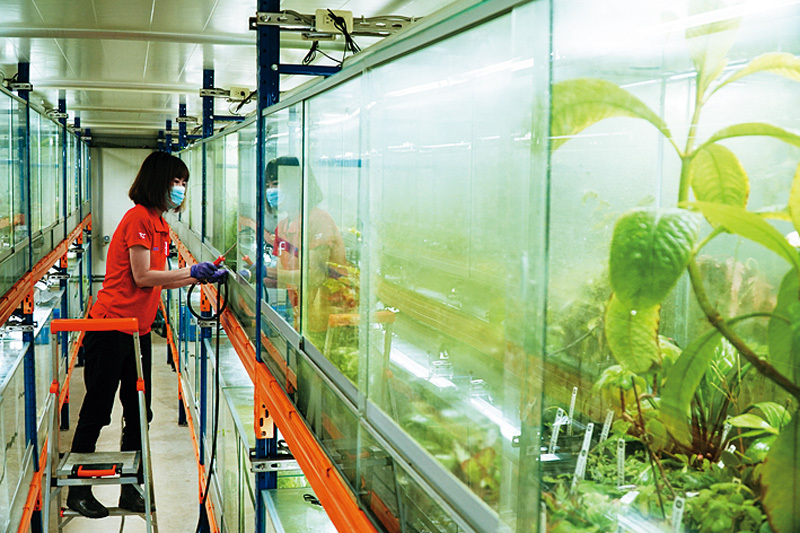 Located in the tropical monsoon climate zone, Gaoshu has a yearly temperature average of 28 ℃ and annual rainfall of 2,500 mm, which are ideal conditions for growing tropical plants. 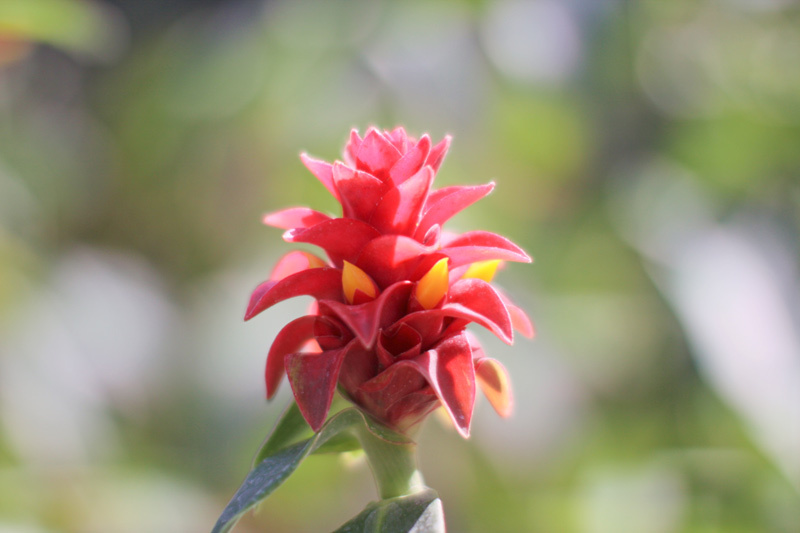 By pooling knowledge, funding, land and a group of plant enthusiasts, the Dr. Cecilia Koo Botanic Conservation Center (KBCC) has evolved into a research institute with the richest collection of living tropical plants in the world. According to the Red List of Vascular Plants of Taiwan, 2017, published by the Endemic Species Research Institute (TESRI), a special agency under the cabinet-level Council of Agriculture, 110 endangered plant species live in non-protected areas in Taiwan whereas 88 percent of all endangered species are found in national conservation areas. However, since the concept of plant conservation is far from being common knowledge in Taiwan, even plants in conservation areas are at risk due to human actions. In 1862, English naturalist and orchid lover Charles Robert Darwin was intrigued by a particular plant from Madagascar – the Christmas Orchid (Angraecum sesquipedale), an epiphytic orchid with a 30cm long nectary spur. He concluded that, in order to pollinate this orchid, there must be insects in Madagascar with elongated mouthparts capable to reach down to the bottom of the exceptionally long spur. Forty years later, Darwin’s prediction was proven true when scientists discovered the hummingbird hawk-moth, witnessing it sucking nectar with its very long tongue. The power of evolution evident in this obligate symbiosis between pollinator and orchid stunned the world for it occurred mysteriously and perfectly in nature! However, daily work at the conservation center is far from being as heroic, as most people would assume of a Save the Earth mission. A typical day of a collection manager begins with a patrol of the greenhouses. In contrast to commercial greenhouses with controlled temperature and controlled humidity, the center’s greenhouses provide numerous micro environments. Each raised bed contains almost 100 species, each of which requires a specific environment. 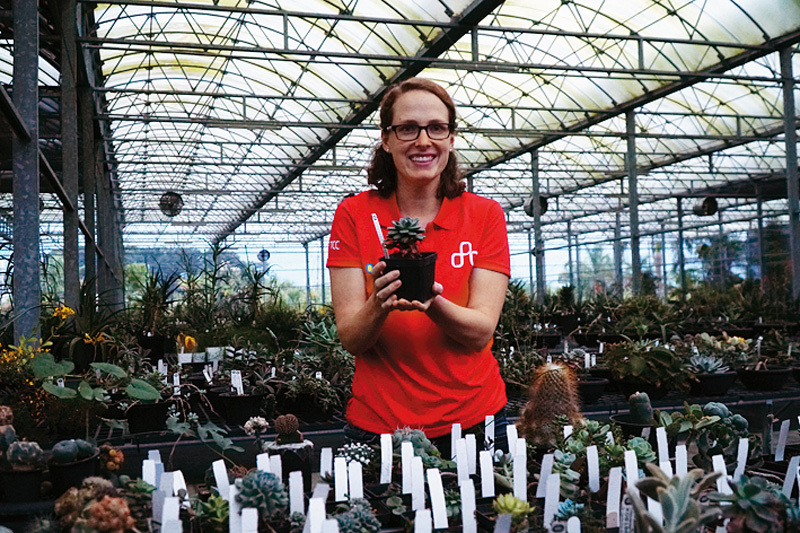 The collection managers must have sharp eyes and minds to discern whether plants are healthy and thrive in their respective environment, and to take immediate action should this not be the case. 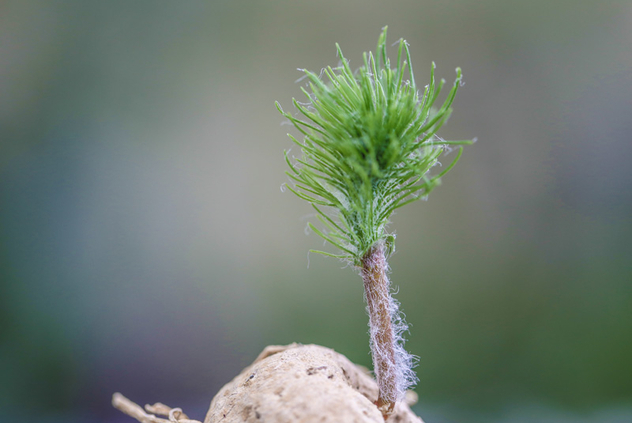 Since the seeds of most tropical plants do not remain viable under currently used cold and dry storage, they need to be preserved as living plants. The 17 greenhouses shelter living collections of orchids (Orchidaceae), ferns (Pteridophytes), aquatic plants, insectivorous plants, Begoniaceae, Gesneriaceae, Melastomataceae and so on that need to undergo domestication and cultivation to ensure that the living specimens can survive in the greenhouse. Only then can the conservation effort be considered successful. 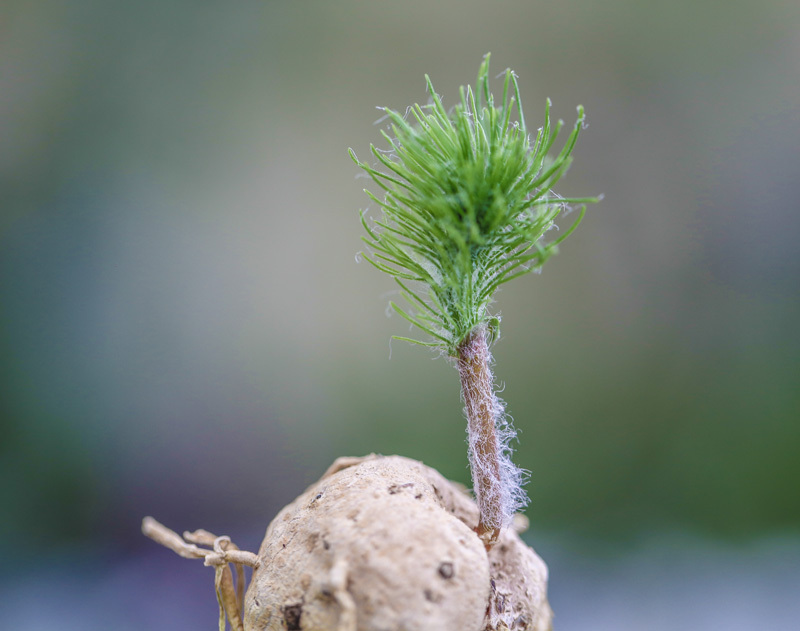 Many plants have never been bred and propagated artificially. The center’s team are racking their brains every day as they try to replicate habitat conditions found in the wild, pampering their precious charges to coax them into putting down roots in their new home. They are overjoyed if the plants they are looking after recover and begin to grow. The center employees come from diverse backgrounds. Aside from the obvious botanists, the center has attracted talent with a background in aerospace engineering, early childhood education, and materials science, forming a versatile team that has proven quite creative in caring for the plants. The team’s composition also reflects the center’s core value of respecting different personality types. The center also runs a deep freeze cryopreservation project with specimens from its living collections to fully conserve genetic plant information for the next generation of scientists. 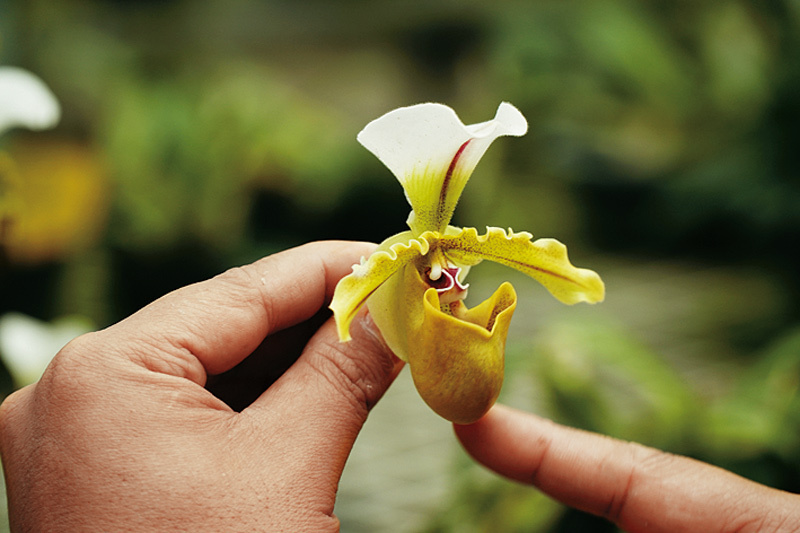 In the greenhouse with the bedazzling orchid collection, Chen quickly spots the magenta moth orchid Phalaenopsis equestris that once could be found in small numbers on Lesser Orchid Island. “Ah-chieh, (plant hunter Hung Hsin-chieh) collected this from a big tree and brought it back ten years ago; it’s already listed as extinct in the wild,” he remarks. 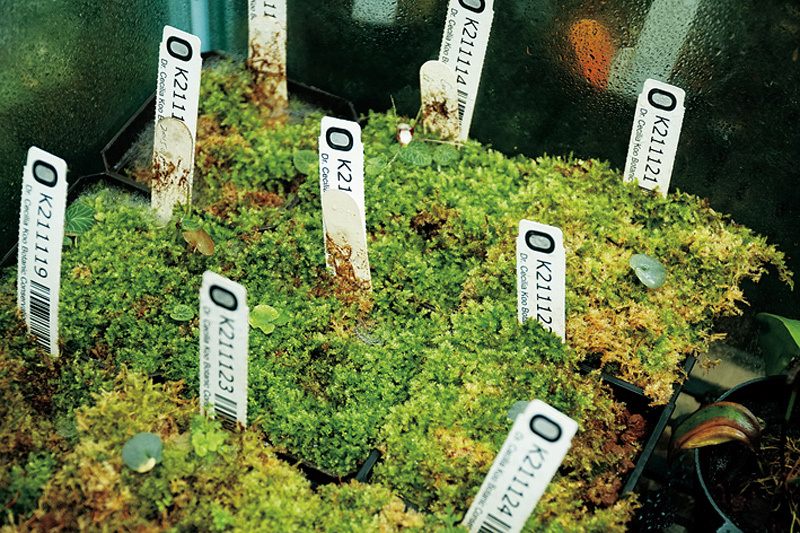 Aside from conserving live specimens, the researchers also work on cloning native plants that have become extinct in the wild. Once enough plants have been produced these can be reintroduced to their original habitats for conservation. At the same time, such efforts provide an opportunity to let the local population participate in the repatriation of these indigenous members of the plant world. The center is not open to the public to protect its environment, but since 2018 it has begun to cooperate with other agencies and organizations. In cooperation with the Education Bureau of Taichung City the center has held classes in the original habitat of Tatushanensis clematis, an endangered Clematis cultivar, to involve students in the process of saving an endangered species. It also curated an exhibition of more than 1,000 rare plants from around the world and endangered species from Taiwan - including many that are closely related to advances in Taiwanese agriculture - at the Smart Agriculture Pavilion of the ongoing Taichung Flora Expo. The fruit of native pineapple species, for instance, was only the size of a table tennis ball. But without these native species there would not be the modern pineapple. As it is impossible to predict which species will play a crucial role amid global warming, species that evolved during different stages of evolution must all be conserved. The exhibition will help people understand conservation and the important role that germplasm plays in it. Initiated by Taiwan biologist Li Chia-wei, a former director of the National Museum of Natural Science, to conserve endangered tropical and subtropical plants, this “Noah’s Ark of plants” set sail for its mission in January 2007 with the support of Leslie Koo, then chairman of Taiwan Cement Corporation. In the eleven years since, the center has gathered more than 30,000 species, making it the conservation area with the most tropical and subtropical plants in the world. Humans began to build collections in the Neolithic Age as they vied for resources in competition with other species and to bolster their capability to explore and exploit their environment. The diverse cultures, species, landforms and climates that exist on this island of 36,000 square kilometers highlight that diversity is Taiwan’s physique. Today, as we do not have to worry about basic needs, the collections of the conservation center serve to give back to nature and to reflect upon our actions, they are a wakeup call and a gift. Mankind will eternally have to work on finding ways to maintain ecological balance when using Earth’s natural resources and pursuing progress at the same time.